I never thought to keep a record of the days or even years my books were "born." It might be a book birthday for one of my books. To be honest, I sometimes forget birthdays, anniversaries (mine), appointments. I try to combat my real life forgetfulness by using a paper planner, my phone—anything that will put dates and times in my face. I remember the month (January) and the year (1998 – ouch) that I got my first acceptance email. Yeah, no call or letter here. I got an email. But I was still excited. I *think* the book published in August of 1998 but don’t quote me on that. My second book released in 1999. Yeah, that doesn’t narrow things down much at all. 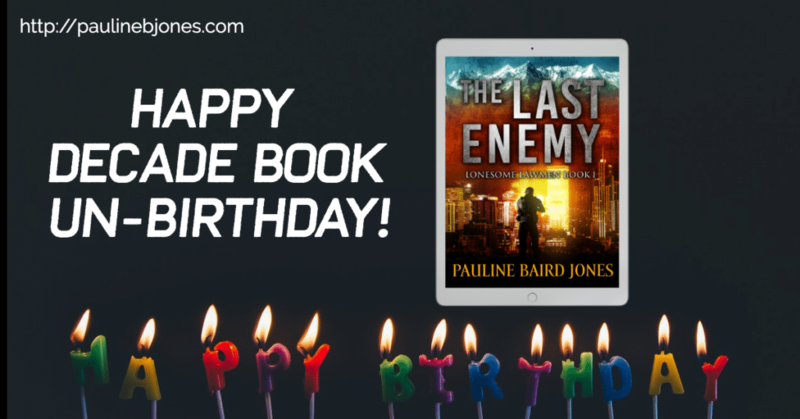 And if I was tracking by year, I missed the decade book birthday for The Spy Who Kissed Me but I can celebrate the decade book birthday for The Last Enemy? Maybe? Or should I wait for the middle of the year? I know it didn’t release in December, but that’s all I’m sure about. Yeah, Life still Happens around here. I wrote about why I wrote The Last Enemy here, so I don’t need to go into that here. Mostly, when I look back I’m startled by how much has changed in publishing (and in my Life) since I wrote the book that was there meant to be a trilogy. There’s probably a pattern I could find here because most of my series started as standalones—as books I just really wanted to write. Then I fell for the supporting cast and kept writing. Of course, back then trilogies were a “thing,” too. (I know, I wrote Lonesome Mama, but that was a short story and meant to provide me — and possibly my readers—some closure.). I guess it is nice to celebrate giving birth to a book that was hard—it stretched me as a writer—but a book that I loved writing. Writing a novel is probably the closest I come to running a marathon. My daughters have told me that there is a place where the pain fades, replaced by joy. It’s a second wind, but better, almost like flying. That’s how writing is for me. I might struggle at the beginning, but then I hit that sweet spot, that place where the second wind picks me up and carries me through the story. Writing “The End” is amazing and a little sad, because my characters are as real to me as the people in my life. And I miss them when their story is done. So I was happy when my publishers at the time asked me to write about the other two brothers, turning it into a trilogy. Both Byte Me and Missing You taught me new things as an author, as a writer, but it’s not their book un-birthdays yet (fingers crossed I remember! Haha). Thanks for reading some of the inspiration behind The Last Enemy: Lonesome Lawmen Book 1. If you would like to pick up a copy you can do that here. PreviousStill Standing #RenovationNextSigns of Alien Life?